This bright 1 bedroom, 2 bath "Beach House "has an ideal location in Puamana on quiet Puamelia Place, steps to the beach access or the footbridge leading to the Club house. It even has a peek of the ocean.This Maui vacation rental has a very comfortable queen sofa sleeper in addition to a King bed in the master suite. The unit has two full baths, washer-dryer, self catering full kitchen, cable TV with VCR and DVD. This townhouse is equipped with high speed internet and digital cable TV. It has a very quiet and secluded lanai for great private dining and relaxing. The private back lanai gives the home a spacious and tropical feel and perfect for relaxing with your favorite book or firing up the BBQ. In Puamana, you have the choice of a sandy beach, 3 surf and SUP paddle or kayak spots, and 3 swimming pools (one is ocean front!) so it’s easy to get in the water every day. 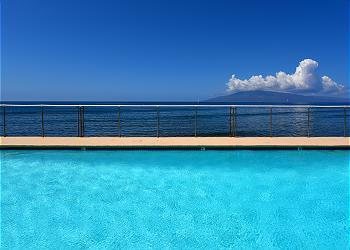 Puamana, a gated community five minutes from historical Lahaina Town is spread out over 30 ocean-front acres. Perhaps one of the best perks of this unit is it's proximity to the alluring waters of the Pacific. A short walk will get you to the ocean where you'll have the prime viewing location for spectacular sunsets, neighboring islands, surfers, and even humpback whales during whale season! Relax on the grassy lawn, cocktail in hand, and let your worries slip away. You can also enjoy the resort's multiple pristine swimming pools, a clubhouse, the tennis courts, and the library. Don't forget about Puamana Beach Park! We've made packing easy for you by providing beach chairs, beach towels, and a cooler, as well as linens, an iron, paper products, and a starter sets of soaps and other amenities. THERE IS A $10.42 A DAY PARKING FEE COLLECTED AT THE FRONT DESK OF THIS PROPERTY UPON ARRIVAL FOR EVERY GUEST. PLEASE STOP INTO THE OFFICE WHEN YOU ARRIVE TO PAY THE FEE. Don't wait! Check out our availability and escape to paradise today.